What do you think of when you hear the word bear? When we hear bear we think: power, strength, intelligence, status and many more (too much to mention). 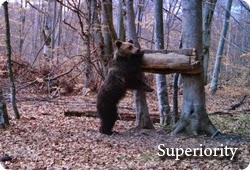 A good summary word for the bear is: Superior. Bears are the biggest and strongest predator in their habitat everywhere they live. They are umbrella specie; they are 'podoaba padurii' (treasure of the forest). Bears are simply built for this important status and like all creatures in nature; bears execute their tasks nearly perfect. All creatures in nature contribute their share to the wellbeing of ecosystems around the world. 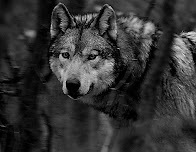 The survival and daily life of all creatures is not only meant for their own survival. Every single living creature on this earth is part of the circle of life and their way of living keeps the circle intact. The circle of life contributes to the production of oxygen, which is vital for the existence of a large variety of our planets inhabitants including us! In the circle of life every individual plays a role to contribute. Some species hold a bigger responsibility then others because of the impact they have on their habitat and the other species living there. Big predators are key species and bears even umbrella specie. When bears and other keystone species disappear, the ecosystem will face disaster: other species will also vanish and some species will grow dominant and become pestiferous. Balance will be gone and cannot be restored by anything else but large predators. The circle of life needs bears! It even depends on bears! It needs superiority. The circle of life contains a yet superior specie: humans. Our intelligence surpasses all other species on planet earth. Through the ages we managed to think of a solution for almost all of the problems we encountered. By being smart we can defeat stronger enemies, collect more food than other species and create quality environmental circumstances to make life easier. Because of this quality we have an enormous advantage over all other living things. We could say: humans own superiority... And this status brings a very big responsibility: the responsibility over the wellbeing of all living things around! The biggest responsibility of all is to keep the circle of life intact. Canine Efficiency takes this responsibility and we want to do that with a lot of companions and supporters.